If you live in a home with small children, there is no doubt that you are in an ongoing pursuit to make sure your home is as safe as possible. Children, by their very nature, are curious. No matter how safe you have worked on making your home, it is almost certain that those curiosities are going to get them in trouble from time to time. What you might not know though is that according to the United States Consumer Protection And Safety Commission, corded window coverings are one of the top five hidden household hazards in American homes. The month of October is National Window Covering Safety Month. Safety should never be sacrificed. We pride ourselves in being a child-safe company and consistently work with our vendors to offer free child-safe upgrades to a number of their products, removing cost as a hindrance to selecting child-safe window coverings. With that in mind, please consider the following safety tips, when it comes to your existing corded window coverings or the new window coverings you are looking to install in your home. Does Safety Mean My Window Coverings Won’t Look As Stylish? One common misconception is that purchasing child safe window coverings means that you will be sacrificing the stylish look and features you are looking to put into your home. This cannot be further from the truth. There are plenty of stylish window shades with numerous customization options you can choose from. 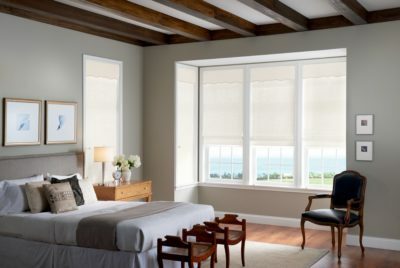 Cellular shades, also called honeycomb shades, remain the most sought-after window coverings–and for a good reason. They come in multiple fabric opacities from sheer to fully opaque. You decide the amount of light or darkness that best fits your room. 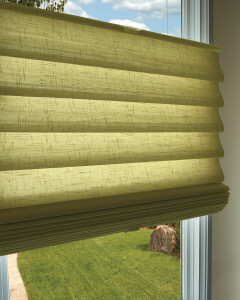 These shades come in an extensive selection of fabrics and textures and a wide range of colors. One of the best features of these shades is their ability to be opened from the top and the bottom, giving you perfect control on the amount of light that enters the room. For instance, if you like to wake up in the morning to natural light, but also want privacy from your neighbors, simply lowering the top portion of the shade easily solves both these problems. Sliding them open or closed from the top or the bottom means that they do not have any dangling cords, thus making them very safe for children. What about larger areas that need window coverings, such as your home’s sliding glass doors? 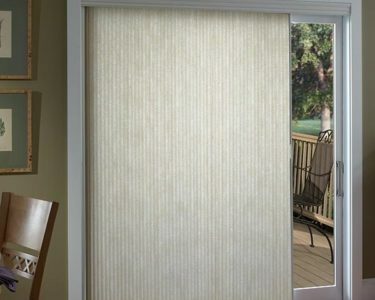 Rather than depending on the corded, vertical blind style shades and the potential strangulation hazards that exist with their long cords, there are also cellular shades that are vertical that are a fantastic option. 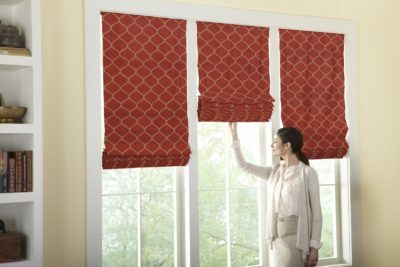 With a vertical cellular shade, Fabric is mounted vertically to create a horizontal open and close operation. Available stacking systems are left stack, right stack, center stack or dual panel. Much like the cellular shades for your windows, the Vertical Cellular Shades come with many color and customization options. Another fantastic advantage to Vertical Cellular Shades is the window space taken up when they are opened. Compared to vertical blinds, Vertical Cellular Shades take up about 7 inches of window space when fully opened. Traditional Vertical Blinds take up much more space than that, limiting your view and the amount of light that enters your home. Even with all the safety features in the world, one thing that will always be a potential concern is how rough children can be on things. If you are fearful of an early demise to cellular shades in your child’s room, cord-free roman shades are a perfect alternative. These shades are made of durable fabric and again feature no cords. Just pull the shade up or down as needed. What If I Can’t Afford To Replace My Window Coverings? If you don’t want to, or can’t afford the extra expense of replacing your window coverings, it may be possible for you to retrofit corded coverings, making your home safer. For some models, it’s a relatively simple and effective process. For instance, you may be able to remove the cords completely, and instead use clips. There are also kits you can get. These kits allow you to clip loops in cords or mount a tension device to a wall to prevent the danger of sagging cords. As a last resort, another option is simply shortening or tying up your window covering cords high and out of sight. This out of sight, out of mind solution will ensure your little one’s curiosity does not get the best of them. While corded window coverings are an often-overlooked household hazard, you should always consider other factors when decorating your small child’s room as well. For instance, any surface a child can climb on, such as a bed, crib, table or chair should be kept a safe distance from windows. Beds and cribs should preferably be put against walls that have no windows. This eliminates the risk of your little one from getting hurt by window coverings, or accidentally falling through the screen and out the window. Even though October is National Window Covering Safety month, window covering cord safety should be a concern every month. Our team of trained, professional technicians are here to answer any questions you have and will work hard to find you the perfect window coverings for your home, with the best safety features for your little ones. Download our guide on child safe window treatments to learn more.